Figure A8. Antalya anomaly, interpreted as the Antalya slab, with (horizontal) [vertical] cross sections through (A)[D] the UUP07 p-wave) and (B)[D] the combined SL2013 and S40RTS s-wave models at 330 km; C) the location of the modern geological record that we interpret to have formed during the subduction of the slab. The Antalya anomaly (Figure A8) is interpreted as a N-S striking, eastward dipping slab dipping below the Bay of Antalya and the western Taurides of southern Turkey. It was first shown in De Boorder et al., 1998), and later, in more detail, by Biryol et al. (2011). 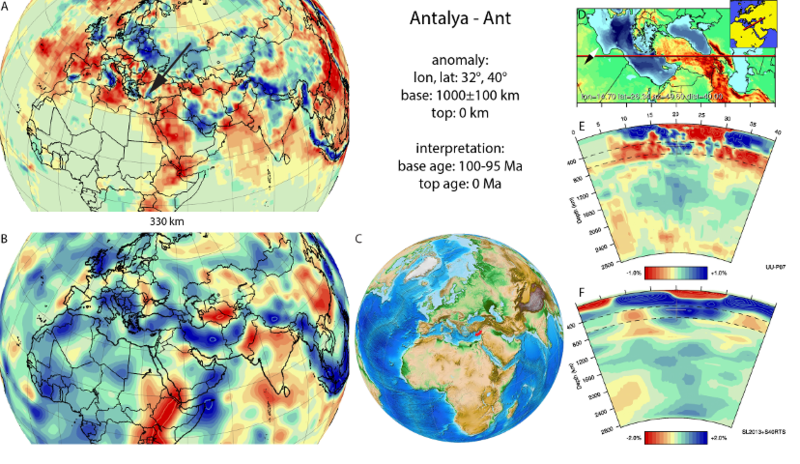 Seismic tomographic images clearly show that the Antalya slab is disconnected from the west-Anatolian-Aegean slab (van Hinsbergen et al., 2010; Biryol et al., 2011) along a NE-SW trending zone that was interpreted as a subduction transform edge propagator (STEP) fault (Govers and Wortel, 2005). Below 300-400 km depth, the Antalya slab becomes tomographically indistinguishable from the Cyprus slab, which plunges down into the top of the lower mantle. Subduction in southern Anatolia occurred below oceanic lithosphere, preserved in a wide belt of ophiolites. Metamorphic sole cooling ages of these ophiolites, widely regarded as forming within several million years after subduction initiation (Hacker, 1990; Wakabayashi and Dilek, 2000; van Hinsbergen et al., 2015), are ~92±3 Ma (Çelik et al., 2006), suggesting subduction initiation several million years earlier, ~95-100 Ma, which we adopt for the age of the base of the Antalya and Cyprus slabs. Even though the Antalya slab is associated with a Benioff zone (Kalyoncuoğlu et al., 2011), it is not evident if and where the Anatlya slab is connected to a subduction thrust at the surface. Biryol et al. (2011) and Schildgen et al. (2012) interpreted the Antalya slab to be a part of the Cyprus slab that tore off and rotated into a N-S orientation. Recently, however, Koç et al. (2015) argued that subduction of the Antalya slab accommodated E-W shortening in the heart of the Isparta angle until at least Pliocene time, and created E-W overriding plate extension in southern Turkey since at least middle Miocene time. Based on a paleomagnetic study of a Central Anatolian volcanic arc, Lefebvre et al. (2013) showed that a N-S trending subduction zone must have already existed since late Cretaceous time and Advokaat et al. (2014a) argued that African plate subduction in Anatolia was accommodated along discrete E-W and N-S trending segments since the onset of subduction. The Antalya and Cyprus slabs may thus have been two independent slabs since the onset of subduction, but their close vicinity makes them tomographically indistinguishable at depth.